I built this transmitter to work with my Progressive Receiver. It is VXO controlled using 21.040 MHz and 21.060 MHzHC6U crystals that I bought at Ocean State Electronics. QP-21 is a CW kit transmitter by MIZUHO company famous in Japan. I began my amateur-activity with this QP-21 transmitter. After half a year from beginning, I add the VXO and power AMP for QP-21. I will show you one more my early age of projects. This is my first phone modulation transmitter. I made this transmitter after makeing some CW transmitter. Then I wanted to grip a microphone and talk about handmade. It covers from 21 to 21.4MHz. It stabilizes in 3 minutes. 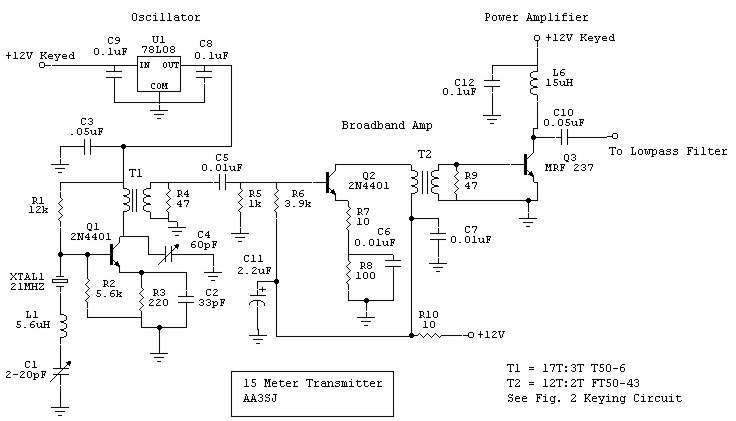 Good for CW or SSB. If you want more, just add a Huff-Puff or a FLL. Proper for DC radios on 15m CW or DSB.